Allied and Enemy Carrier and Land based Bomber Strikes. Central, South, Southwest Pacific February 1944. Islands were chosen as the most suitable for the end in view. The Green Islands consist of an atoll 4 miles in diameter, surrounding a lagoon of ample depth, but with only two navigable entrances on the west side. Composing the atoll are Green (Nissan), Barahun, and Sirot Islands. Lying very close to the NW is Pinipel Island, The Green Islands are 125 miles from Cape Torokina, 117 miles from Rabaul, and 235 miles from Kavieng. 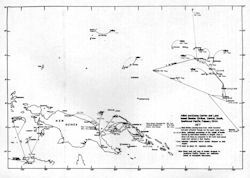 They form the northernmost extremity of the Solomons Chain and offered not only an advantageous base for operations to the northwest, but also a point from which Japanese barge traffic between Rabaul and Buka could be interrupted. They served the enemy as a staging point for this service up to the time of their capture. Green Islands would also be of value if the seizure of Emirau were adopted as an alternative to Kavieng. The Green Islands could provide a field near enough to Kavieng and could be covered by Torokina fighting planes during the landing and construction phases. 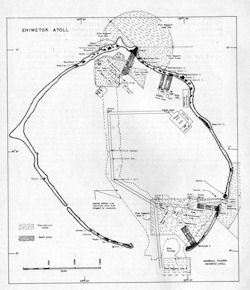 It was also considered desirable to undertake intermediate operations before the seizure of Kavieng (or Emirau) in order to retain initiative and provoke enemy reactions, enabling us to engage his forces. 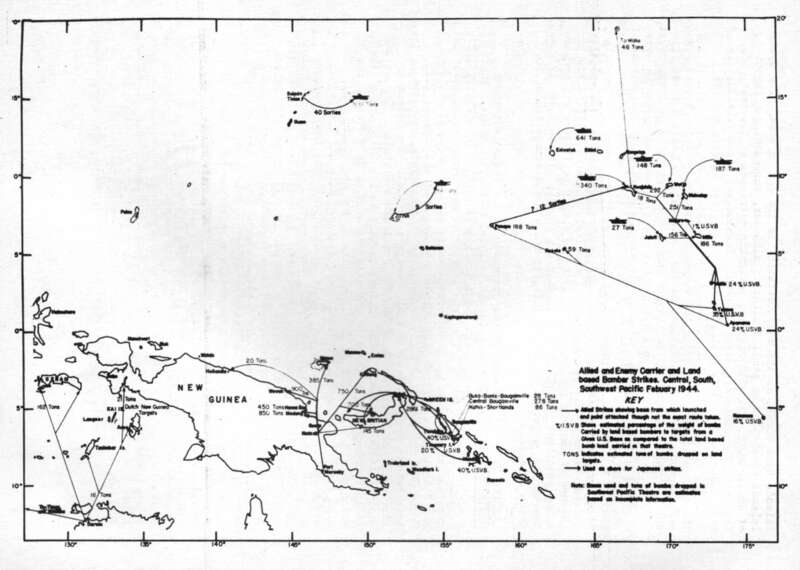 February 15, 1944 was, therefore, selected as target date for seizure and occupation of the Green Islands. 4,344 tons of supplies and equipment, Next day the troops moved southward on both sides of the atoll against the principal enemy garrison at the south end of Green Island, and by the 19th had wiped out this group, A small group of the enemy was eradicated on Sirot Island on the 17th and on the 19th, 14 Japanese were found and killed on Sau Island, adjacent to Pinipel. Due to the simultaneous bombing of enemy bases and the heavy combat air patrols enemy air opposition was negligible. The Second Echelon of 8 high speed transports, 11 LST's and 2 LCI's brought 4,715 more troops on the 18th and took 1,147 friendly natives to Guadalcanal. The Third Echelon of 10 LST's, 3 LCI's brought 2,577 more troops on the 25th and altogether 4 more Echelons arrived until the total of 16,448 personnel and 43,088 tons of supplies had been landed. from the first day construction battalions prosecuted work on airfields, a tank farm, roads and base installations. By the end of February the fighter strip was nearly complete and surveys for a bomber strip were well advanced. An emergency landing was successfully made on 4 March and the strip was ready to stage fighter aircraft on the 7th. The Coast Guard manned LST-166 on the 17th of February loaded 260 tons of organization equipment, 200 tons of vehicles, 3 officers and 250 enlisted men of the 33rd Naval Construction Battalion at Renard Sound, Russell Islands for transportation to Green Island. On the 19th the 2nd Green Island Echelon (31.5) was formed consisting of an APD unit of 8 high speed transports and 10 LST's, of which the LST's 166 and 71 were Coast Guard manned, and 2 LCI's, They were escorted by seven destroyers and a tug and beached on Green Island on the 20th. 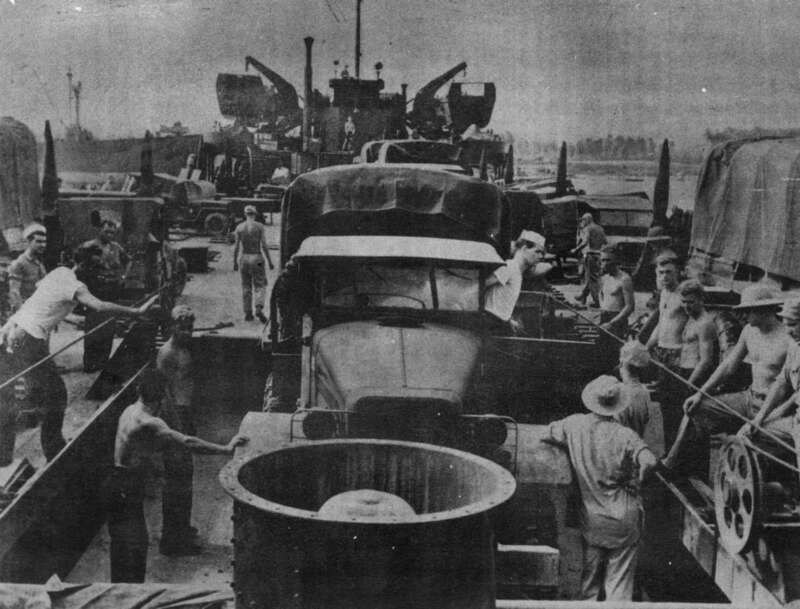 At 1115 they completed unloading troops and cargo and reloaded for trailers for return to Guadalcanal. At 1205 they retracted from the beach and stood out of the Green Island Lagoon. On the 21st while en route Guadalcanal anti-aircraft fire and flares were observed on the port beam of the LST-166 in the vicinity of Bougainville. On the 12th of February the Coast Guard manned LST-207 beached at the south shore of Ondonga Island in the New Georgia's to load personnel and cargo of the 37th Special Battalion Naval Construction Battalion for transportation to Green Islands. Enemy planes on the 13th were bombing an airstrip half a mile away as the LST completed loading 690 tons of cargo and 250 Navy Seabees and the LST retracted and joined the destroyer Terry off Munda Bar. At 1750 Task Force 31.4.3 consisting of six more LST's, including the Coast Guard manned LST-70 and screened by 6 destroyers, got under way. Anti-aircraft firing and flares were observed during the night of 14-15 February and at 0650 on the 15th convoy escorts were in action against enemy planes. At 0849, the LST-207 passed into Nissan Island Lagoon and then put bulldozers ashore for road work. By 1422 all cargo was unloaded and six empty trailers were back on board. The convoy formed at 1800 and proceeded. columns from port to starboard. Some of the LST-207's guns opened fire. The plane turned away from the convoy and, flying low, headed toward a destroyer. At 0705 the same morning a plane approached from astern, about three miles distant and 12,000 feet in altitude. It gradually decreased altitude but could not be identified until abeam of the ship at 3,000 feet. The LST's starboard guns opened fire when the plane was about 200 yards to starboard. The plane dropped two small bombs which struck the water about 200 yards out and 200 yards forward of the vessel and then veered upward and away from the convoy. During both attacks the LST's were flying barrage balloons. On the second attack the plane was running above and along the line of balloons, using them to sight on, but due to the brisk breeze from port, the balloons were some distance out to starboard instead of directly over the vessels. This was believed to have caused the bombs to miss the vessel. The LST-207 made two other trips from Guadalcanal to Green Island in the succeeding Echelons on the 6th and 16th of March, 1944. Allied occupation of these low and thickly wooded is lands effectively blocked the barge supply route from Rabaul and Kavieng to the beleaguered garrisons in the northern Solomons which were estimated at about 20,000 men. This left the enemy on Choiseul, Bougainville, and Buka Islands virtually isolated from the principal Japanese bases to the north. For all strategic military purposes this completed the campaign for the Solomon Islands begun at Guadalcanal on August 7, 1942 and continued throughout 1943 with the conquest of the New Georgia group and the establishment of the beachhead on Empress Augusta Bay, Bougainville Island.